Hollybeary Creations : YNS August Release Hop!!! 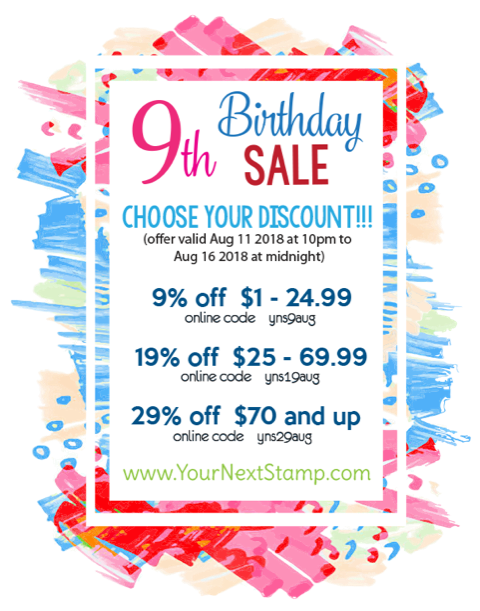 It's time for the Your Next Stamp August Release Hop and Birthday celebration!!! Your Next Stamp is turning 9 this month and to celebrate we have a Fun Gumdrop Game and we're giving away 9 - $20 Gift Certificates to the store!!!! 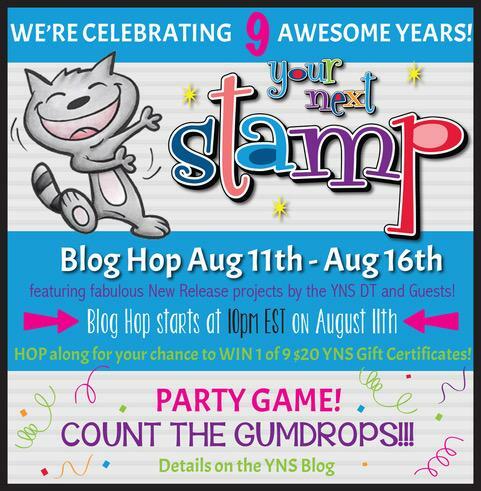 As you hop along through each project be sure to count the number of gumdrops you see and then head over to the YNS Blog Hop post and leave your count in the Linky for a chance to win a Gumdrop Prize Pack! And don't forget to leave comments along the way on each blog and the YNS Blog for a Chance to win one of those 9 - $20 GC to the store! 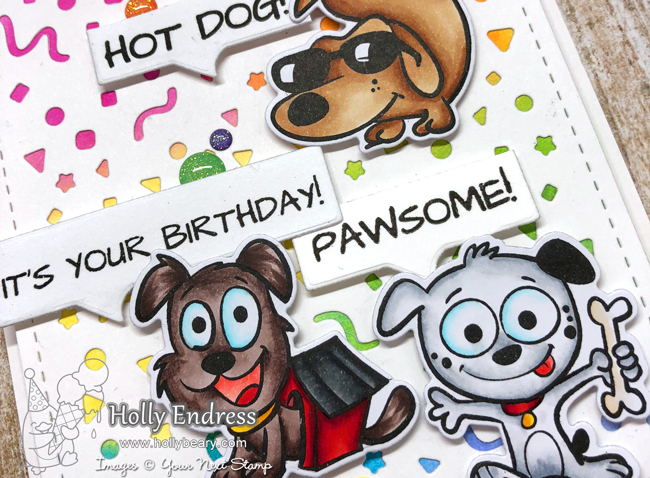 My first project shares the new Confetti Panel die and the Super Cute PAWsome Pups Stamp and Die set. I also used the new Rainbow Sparkly gumdrops. I die cut the panel die from some White cardstock and then I added a piece of watercolor paper behind it that I added some Distress inks to in Rainbow colors. Then I adhered that panel to a Card base with some Fun Foam. I die cut the sentiments using the new Talk Bubble Die and some Black Olive Ink. Then I stamped each of the images onto some X- Press It blending cardstock and colored them in with Copics. I used the coordinating dies to cut them out. I adhered the images with some Foam tape and then I added the gumdrops. So cute!!! I think this is my Favorite set from the release, these images are so fun to color! 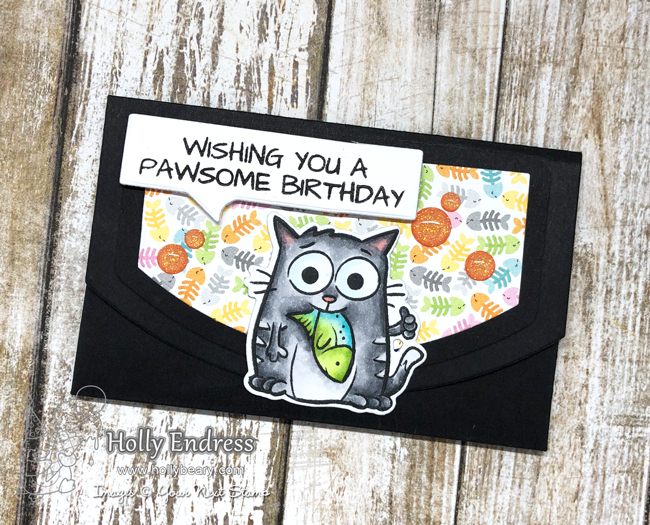 For my second project, I created a Gift Card holder using the new Gift Card Holder Die and the Cool Cats Stamp and Coordinating die set. I cut the gift card holder from some Black cardstock and then I added some Pattern paper I had in my stash. I used the extras in the die set to cut those out as well. Then I stamped and colored the image and used the dies to cut him out. I adhered him over the little half circle that you slip the top into to close the gift card. I added a few more of the Rainbow Gumdrops and used the Talk Bubble die. There are three sentiments in this die set as well that you can die cut so I used just for you and adhered it on the backside of the gift card holder. Don't forget about our Birthday Sale too in the store so you can stock up on all your Favs from the release! Are you ready to get Hopping and Win some prizes???? Your Pup card is ADORABLE!!! Love the way you used the talk bubble. A-dorable! LOVE your coloring Holly! Love those cute little pups! Too cute! Your card and your gift card pocket are adorable ! Your little doggies are so cute. Of course, your little cat is lovely too. Thank you for sharing your creativity with us. favorite, though. He just makes me giggle. So cute! that cat with a fish in its mouth is hilarious. Love the puppies having so much fun. Animals are always a hit. Sweet card and gift card holder! Fantastically fun and happy projects! Beautiful coloring and amazing designs. These cards are adorable. Love the pawsome pups. The confetti background is great too. Thanks for sharing. Your dog card is just too cute! The little dogs are adorable on the rainbow confetti panel! And I love the cat with the fish in his mouth. The big eyes on the critters are so cute! Super Duper CUTE cards! Totally LOVE the Paw-some stamp set!! Very cute cards I really like the rainbow confetti and the very versatile gift card die. Both adorable cards! Loving the confetti panel! Pups and cats.... I love both sets. These are super cute!! Love all those adorable pups. And your gift card holder is just too cute! The Cool Cats gift card holder is the best! Love your cards!! LOVE the cool dog with sunglasses. This is a really fun card! How fun and festive. I like your coloring. Such great projects, Holly!! I love that colored background peeking through the die. A wonderful card and gift card holder. I just love those cute pups. Love your Pawsome Pups card! Super cute Holly, LOVE The gift card! Fabulous projects! 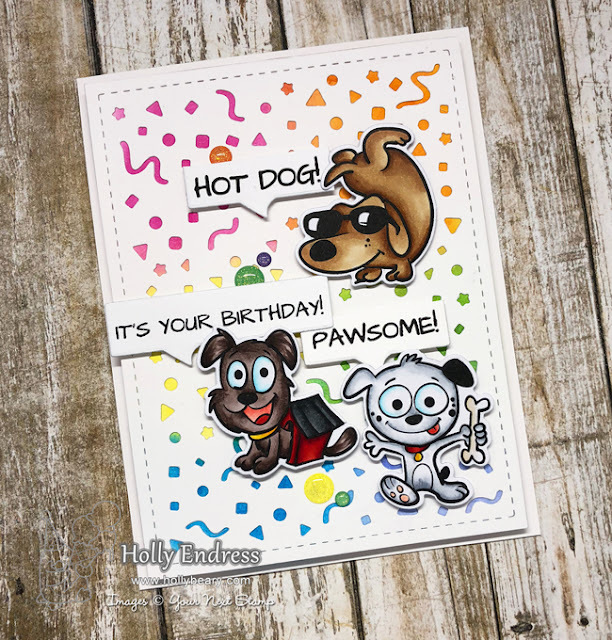 I love your hot dog card - adorable and fantastic design! Oh my gosh, your puppy card is so fun and colorful!! It makes me smile! The gift card holder is so fun. I love the colorful fish bone paper and how you colored up the image. These projects are adorable with the cute critters. Love the gift card holder. Very cute cards. My 2 favorite are the cool cats and dog release but since I'm a cat person, I need to have the cat set. Such great stamps and dies. I love all of these awesome creations! Those pups just make you smile! Love, love, love this adorably sweet card and gift card holder! So fun and your coloring is amazing on them both! That cat with the fish, makes me laugh, awesome job, these are wonderful! Way to go! Both of these super cute projects put a huge smile on my face! They must have been so fun to create! I love your cards!!! The bones background is awesome!!! The cat with the fish is so funny!! Your coloring is perfect!! I love it all!! Great job!! These are great creations. I love the celebrating critters, they’re so cute ! Love all the bright colors popping out from behind the background cut plate. Such a fun touch with all those great dogs and sentiments. So fun! What cute and beautiful projects. Love them both. Your creations are so pretty! I just love how colorful they are!